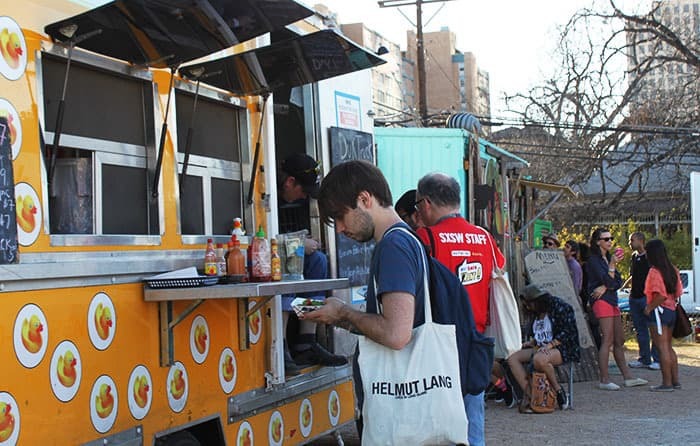 I landed in the heart of SXSW on Tuesday morning and have been in a whirlwind of music mayhem, documentary films, and more food trucks than I know what to do with. 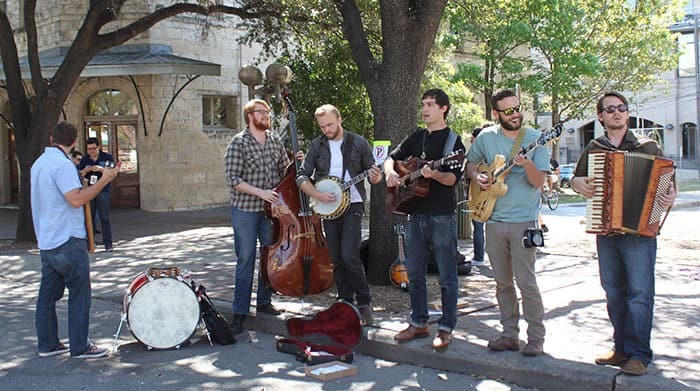 For those of you that might not be familiar with SXSW, it’s a two week long music/film/interactive festival filled with tech geeks and hipster chic. So where’s the first place I headed to when I got in? A charity bar of course. The White House is said to be America’s first charity bar and basically you drink to your heart’s content and instead of paying for each drink, you make a donation. You can donate to the Austin Humane Society, Special Olympics of Texas, Austin Symphony Orchestra, and a ton more. 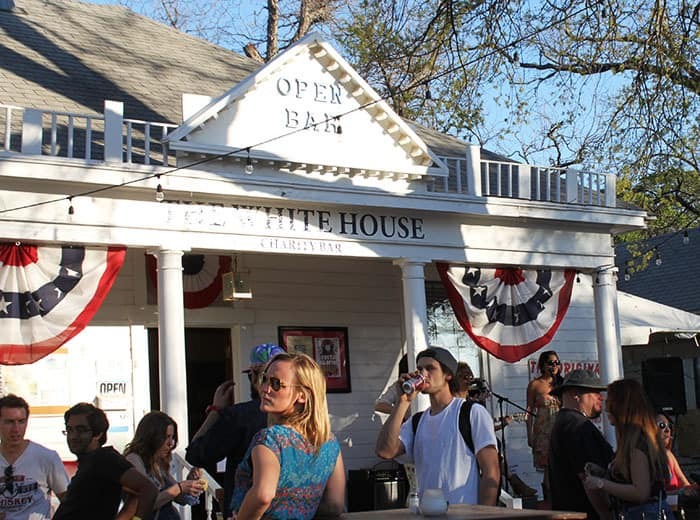 On the same block of Rainey Street as The White House, you will notice several old bungalows turned bars. It’s like having a cocktail in your living room. Turn the corner and you’re encircled in food truck heaven. Do you go airstream trailer turned cupcake palace? I think so. 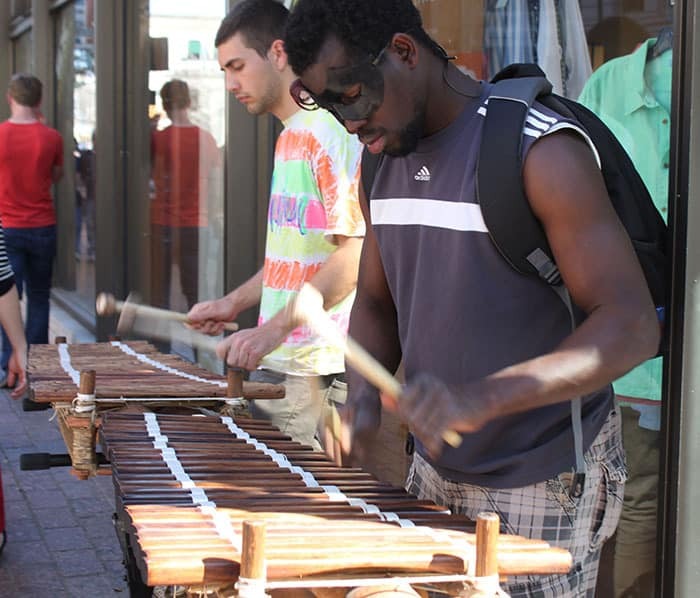 Practically every street downtown is bursting with the sounds of live music. 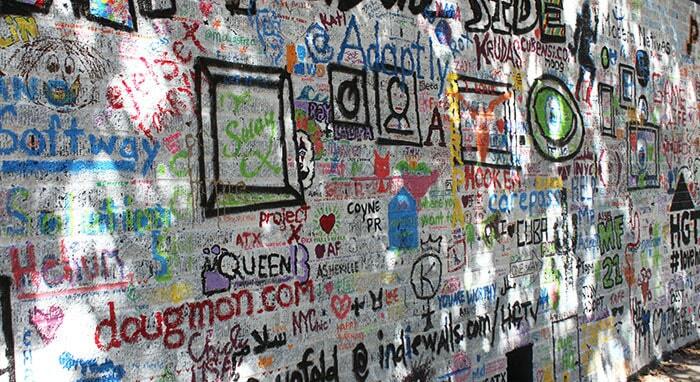 And walls are quickly becoming covered in ever-changing art. To think, this is only day four of our trip. Bring it on! If you have any suggestions for New Orleans must-sees please send them my way. Man, I live in Austin and don’t even venture out to SXSW. A great food place is Hula Hut, just a few miles west of downtown, overlooking a lake. For fabric shops you must go to The Stitch Lab, also real close to downtown (on 1st a 1/4 mile south of Barton Springs). It’s a cute little house transformed into a sewing/fabric studio. Mayfield Park can also be nice, it’s a real small part/garden, but they have live peacocks roaming it. Are you heading to New Orleans afterwards, since you asked for must see places there too? The Ghost tours are really cool, packed with spooky New Orleans history. Do you have kiddos with you? The street cars are always fun, they cost 1.25. Hop on one in the quarter that says “city park” and ride to the end of the line – there’s the art museum, a beautiful new trail around the lake, the sculpture garden (free), playgrounds and story land and the amusement park. You can buy tickets to story land (3 bucks I think) and hop on the little train that takes you in a loop around the park – it’s a lot of fun and very beautiful. No kiddos? Then the quarter of course 🙂 my favorite thing to do is a buy a can of beer and walk to the moonwalk where you can sit and watch the boats on the river. OH COLLEEN, I WANT TO GO TO THERE! I cant believe you are 3.5 hours away from me right now Colleen! Looks awesome! 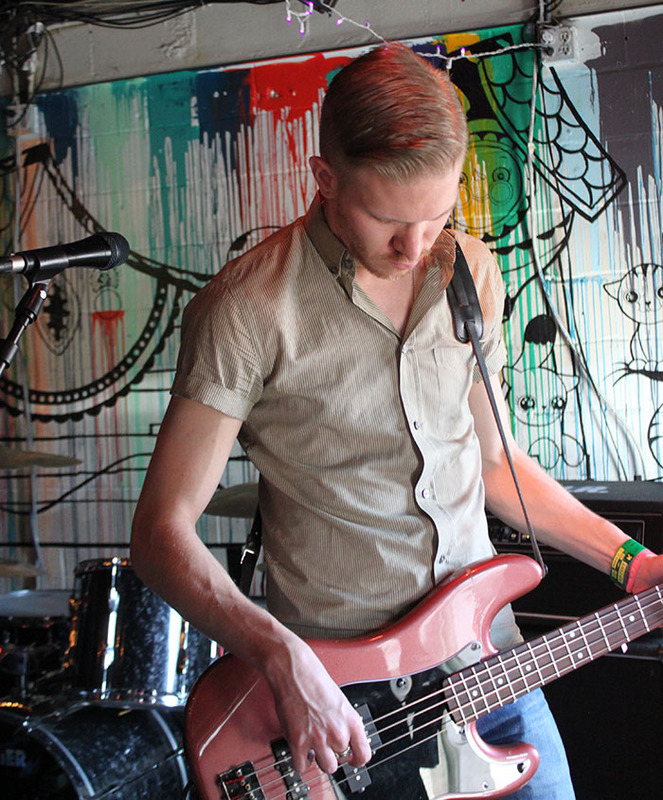 Check out the band Paper Lions while you are at SXSW!! http://paperlions.com/ You wont regret it! Great guys who put on a great show! I am so jealous of your tip to SXSW. It’s a dream! Have fun and please update us on the greatness! While in New Orleans, you must go to Avenue Pub and order Buddha’s Temptation. You can thank me later. 😉 Jackson Square is a great place to pick up a piece of colorful street art for a souvenir.